The Richmond Art Gallery’s Artist Salon is a free monthly program for artists to connect, network and learn from each other. The November session features textile artists Deirdre Pinnock and Nadine Flagel. Together they recently completed “Stepping Stones,” a permanent textile “Legacy Artwork” installed in the Richmond City Centre Community Centre. For both Deirdre and Nadine this was their first public art commission and their first collaboration, and it required a lot of learning from the exhilarating moment of being awarded the project. Deirdre and Nadine will speak to the many challenges and rewards of working collaboratively and to the differences between independent and commissioned artwork. They will break down or demystify the process of proposing and completing a public artwork. They especially welcome “outsider” artists, self-taught artists, recent graduates of art programs, and anyone interested in seeing a public artwork turned inside out. To explore the “Stepping Stones” project, search Instagram for #ragstorichmond. Free admission. Due to limited spaces, registration required at Eventbrite here. Nadine Flagel is a self-taught textile and fibre artist whose mission is making art out of “making do.” She also holds a Ph.D. in English Literature from Dalhousie and teaches literature and composition at Simon Fraser University. She is interested in the repurposing of both texts and textiles. Both practices rely on cutting up existing text(ile)s, on aesthetic and sensual appeal, on thrift, and on putting old things into new combinations, thereby intensifying and multiplying meanings. Nadine has published a number of articles on textile art, teaches rug hooking at Maiwa School of Textiles, and has received grants to make art with youth. She is also a member of the Vancouver Guild of Fibre Artists and the Craft Council of British Columbia. As a settler, Nadine lives and works on unceded land of the Sḵwx̱wú7mesh (Squamish), səl̓ilwətaɁɬ (Tsleil-Waututh), and xʷməθkʷəy̓əm (Musqueam) peoples. Since 2000, Deirdre Pinnock has been hooking rugs for fun and for therapy. In 2017 she made a satirical rug about American politics called “The Welcome Mat,” and was told that she should put her talent out there for others to see, so she started exhibiting and talking and writing about her art. The sisterhood of rughookers allows her the opportunity to meet weavers and knitters and other supporters who have propelled her to create outside her comfort zone. She frequently yarnbombs supportive messages around construction sites in her rapidly-changing East Vancouver neighbourhood. Her newfound confidence and creativity has validated her so much that she’s also taken on the Performing Arts, and occasionally you will find her at a local comedy venue performing as a standup comic. Join the Richmond Artists Salon Facebook group for discussion and tips on local art opportunities, professional development, and more. 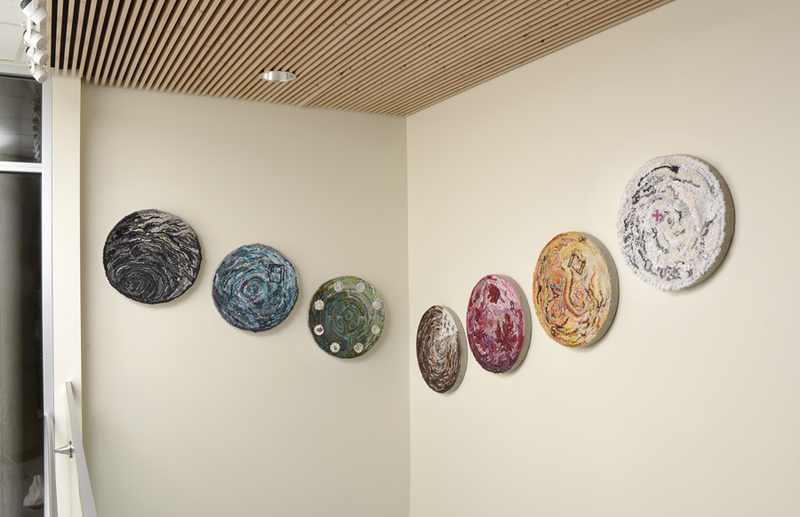 Above: "Stepping Stones", Richmond Public Art "Legacy Artwork" at City Centre Community Centre. Photo by Image This Photographics Inc.